A noted documentary junkie, IUPUI standout volleyball player Abby Boatman credits her current career trajectory on a Netflix documentary. It was her junior year of high school and Boatman tuned in to the 2013 documentary entitled 'Remote Area Medical'. The documentary chronicles an annual three-day "pop up" medical clinic organized inside Bristol Motor Speedway by the non-profit group called Remote Area Medical (RAM). The three-day clinic offered free dental, medical and vision healthcare to low income individuals and the documentary took a detailed look at the setup of the clinic and the impacted individuals. "[The documentary] does a good job of following all things that go into putting on a clinic and [shows] the quality of care the patients receive," Boatman said. "It was amazing to see the organization behind the scenes, how everyone works together and all the pieces that have to come together the way they do. Then to see the impact take shape with the patients they treat is pretty powerful. "I was always fascinated with the medical field and like to do things with my hands. With dentistry, you can really make an incredible impact on someone through their smile. It affects everything." Fast forward to Boatman's sophomore year of college and she was thriving academically while majoring in Environmental Health Sciences. Yet that documentary still lingered and Boatman wondered if RAM accepted interns. A simple, well-timed internet search pointed her in the appropriate direction and sure enough, she was among a handful of college aged students selected from a group of more than 70 applicants for an internship in the Summer of 2017. Boatman spent a chunk of her summer in Knoxville, Tenn., working four different clinics in just more than a month. Boatman's passion for giving back has also driven her to seek dental shadowing experiences in community health center settings as she would like to work with underserved communities in the future. She has served as the Volunteer Coordinator for the Pre-Dental Club at IUPUI, while also participating in Martin Luther King and Cesar Chavez Days of Service on campus. In addition, she and her teammates mentored third-grade students at Cold Springs Elementary and were active with the Jags Reading Club and Paw's Pantry. She also represented the volleyball program at the Colts Change the Play Program partnership with Riley Children's Hospital. "It important for [student-athletes] to give back," Boatman said. Between the lines, things haven't always been so smooth for the Bloomington-native. A standout player at Bloomington South, she had her senior season derailed due to injury and found playing time sparse as a freshman at IUPUI. 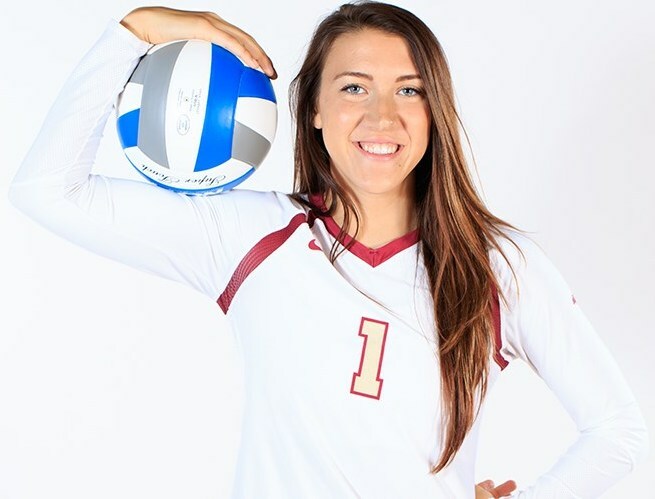 "College volleyball is a different world than high school," Boatman admitted. "It was tough because I wasn't playing a ton and there's pressure there to perform. I went from a really good high school player to a player that I didn't even recognize." Head coach Steve Payne completely retooled her game. Boatman came to IUPUI as an electrifying athlete with much yet to learn on the court. "I was trying to trust the process. Coach Payne does a good job of taking raw players and turning them into really good players," Boatman said. "I knew I was going to get worse before I got better. I had times where it was easier to go back and play the way I want, but I knew it may not be for the best. I give Coach Payne credit, he listened to me and there was some give-and-take." Boatman rewarded her coach by emerging as one of The Summit League's top defensive players as a sophomore as she was a two-time league Defensive Player of the Week. She closed the year with a team-high 111 total blocks and 1.05 blocks/set. Offensively, she put down 157 kills and played all but four sets for the Jaguars. As a junior, Boatman repeated with a team-high 142 total blocks, marking the second-highest single-season mark in school history. She started all 31 matches while helping the Jaguars to a 12-4 record in the program's first season of Horizon League play. She was voted to the Horizon League All-Academic Team and enters her senior season already among the program's top-10 in every blocking category. Earlier this week, Boatman was informed that she was the most recent recipient of the Michael A. Carroll Scholarship, given annually to one IUPUI student-athlete based on their commitment to community service, along with academic and athletic prowess. "Abby truly embodies what being an IUPUI student-athlete is all about by being an excellent student along with being a top player on our team and in the Horizon League," Payne said. "She works hard on the court to make herself and her teammates better. I'm lucky to be coaching such a good player and quality person on our team. She represents IUPUI Athletics and our program with pride and dignity." Behind the scenes, Boatman and her classmates have taken it upon themselves to make the program more welcoming to younger student-athletes, and credits those efforts to part of the team's success. "It's little things like checking in with the freshmen and underclassmen and not just sticking with the other upperclassmen," Boatman said. "Lizzie [Scott] has been awesome too and got really close to the freshmen this year. Same with Maggie [Gibson]. I think we're more fluid on the court because we all get along well and we know how to play with each other." Heading into her senior year, Boatman has some clearcut goals. She hopes to be admitted to dental school, be named a team captain while helping the Jaguars to a Horizon League title, while also tying or breaking the program's all-time blocks record. She enters 2018 147 blocks shy of tying the record. The single-season school record for blocks in a season is 148. An IUPUI trip to the NCAA Tournament, which would be the program's first since 2013, would certainly enhance her chances. The middle blocker who wears the No. 1 jersey won't be content settling for second. And as history has shown, whatever she's put her mind to has seemingly come true. This article originally ran on the official site of IUPUI Athletics, IUPUIJags.com.